The Scott Volt-X 40 is a suitable introduction to the world of BMX for younger riders who want to expand their skills and get the same level of quality as experienced by adult riders from this popular brand. 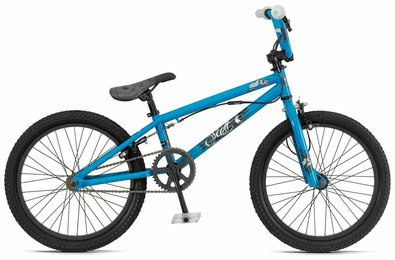 Like all good BMX bikes this is designed to be durable so it should take a healthy amount of wear and tear, even in the hands of a particularly enthusiastic youngster. Scott has used its 18.5-inch frame for this model and it benefits from Tektro brakes on the front and rear along with Kenda tyres and spokes which are rigid enough to withstand jumps and tricks. As you might expect, this is a single speed bike, giving the rider direct control over the wheels and allowing for precise handling along with suitable power. This is exactly the kind of set up that budding BMX riders require to hone their talents, so it is definitely a worthy investment if you have a keen young person who wants to get into this type of cycling. Looks are a little more important to kids who want to impress their mates and the Scott Volt-X 40 is suitably stylish in this respect. With a bright blue frame, cool Scott logo and transparent pedals, it is every inch the urban bike and the black rims mark this out as a carefully styled bike.